The Albany Half Dollar is one of 20 1936-dated commemorative silver coins issued by the United States Mint. The coin was authorized by Public Law 687, which authorized the “production of a minimum of 25,000 coins dated 1936 and bearing a special single design to commemorative the 250th Anniversary of the founding of the city”. 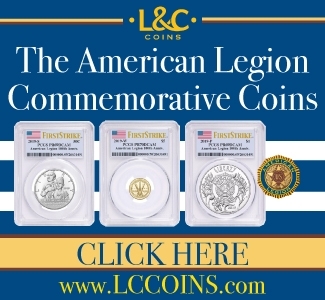 The commemorative coins were struck after the Mint received payment and the production window for the coin was one year following the June 16, 1936 enactment of the law. After the Committee made its payment, production of the coins began in October. The Albany Half Dollar design features two distinct sides. 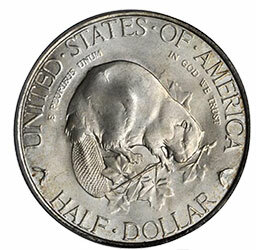 On the obverse is a depiction of a beaver gnawing on a branch of maple. The maple tree is the New York State Tree, while the beaver played an important role in colonial commerce. Artist Gertrude Lathrop used a live beaver as a model and did painstaking research to create the historically-accurate reverse design, which features the city of Albany’s first mayor, Peter Schulyer, and New York’s colonial governor Thomas Dongan, shaking hands during the presentation of the City Charter. Dongan’s secretary Robert Livingston stands in the background. 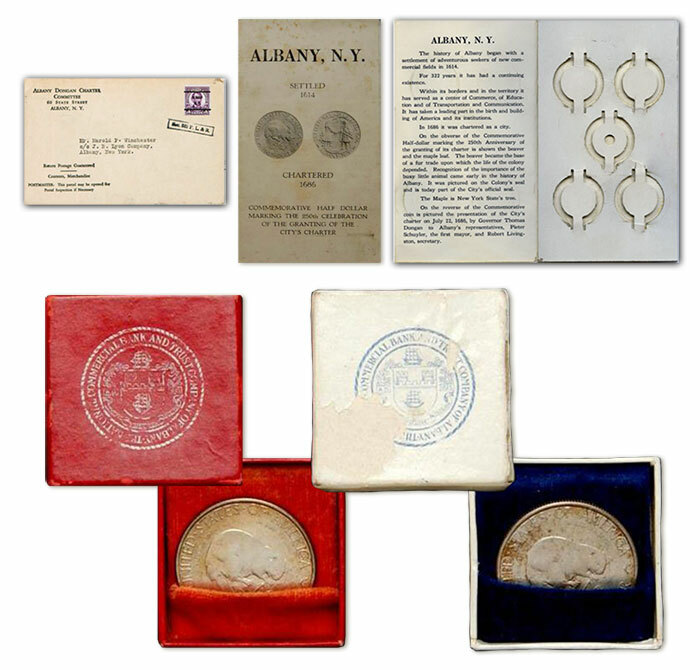 Top: Albany Charter half dollar with booklet and five coin holder with envelope. Bottom: The red and blue boxes illustrated above are from the Helen Carmody Estate. The boxes and enclosed coins sold at Stack’s Bowers March 8, 2005, auction for $4,370 USD. Although struck by the Mint, distribution of the 250th Anniversary of Albany half dollar was handled by the Albany Dongan Charter Committee. The committee ventured to sell the coins during the city’s 250th Anniversary celebration and took orders via the mail. The coin was more expensive than other commemorative half dollar coins issued in 1936 and carried a price of $2.00 per unit. The committee had a stockpile of 25,000 coins to sell and managed to distribute several thousand of them, but nowhere near enough to liquidate its entire holdings. After the committee’s promotional period concluded, a few thousand unsold coins were then marketed by the National Commercial Bank and Trust Company of Albany. The bank did not use the Albany Dongan Charter Committee’s packaging and instead produced a single coin box to house the commemorative. At least two versions of the bank’s packaging are known: One is red, with a red velvet insert, and the bank’s logo printed in white. A second style features a white box with an indigo blue velvet insert, with the bank’s logo printed in blue. The period in which the bank marketed the coins is unclear, but the fact that the Albany half dollars were being marketed at the initial issue price of $2.00 was brought to the attention of hobbyists and dealers in 1954. At the time, the market value of the coin had increased to between $7.50 and $8.00. Today, Albany half dollars are seldom encountered with their original marketing materials. Examples with original packaging, especially packaging in fine or better condition, command a significant premium over coins in a similar condition without. The official distribution number of 17,671 takes into account the melting of 7,329 unsold coins. The melting of unsold coins was a common occurrence over the course of the classic commemorative coin period. In his Encyclopedia of the Commemorative Coins of the United States, Anthony Swiatek describes a possible unofficial melt that may have wiped out a large accumulation of coins decades later. 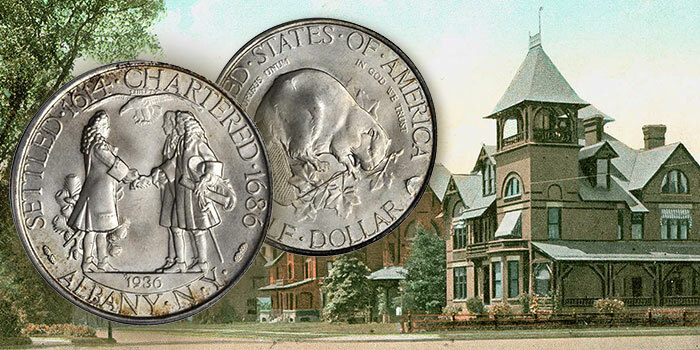 According to Swiatek, a significant accumulation of Albany halves was stolen from a collector during a February 1979 burglary. The victim’s brother states that some 638 coins, all stored in non-descript half dollar rolls, were taken from a safe deposit box and never seen again. Given the state of the silver market, Swiatek speculates that the coins, which would have had a value of over $220,000 at the time, were likely melted for their much lower silver content. Assuming this account is correct, no more than 17,033 Albany half dollars survive today. Classic commemorative coins have the potential of being good values in today’s market, but in order for this to be the case, the series will require a major infusion of new collectors. For decades, U.S. commemorative coins have lagged far behind other series. 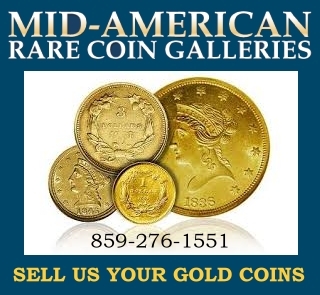 Despite their beauty, historical flavor, and low mintages, commemorative coins struck between 1892 and 1954 today sell for a fraction of what they sold for at the height of the market in the 1980s. 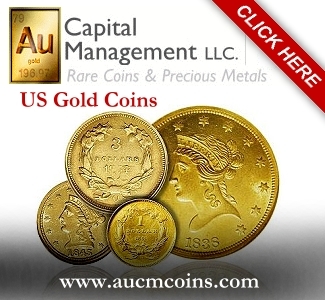 At that time, the coins were heavily promoted as investments. Today, commemoratives are collected by enthusiasts. If more collectors become enthusiastic about the series, today’s prices will seem like a bargain. 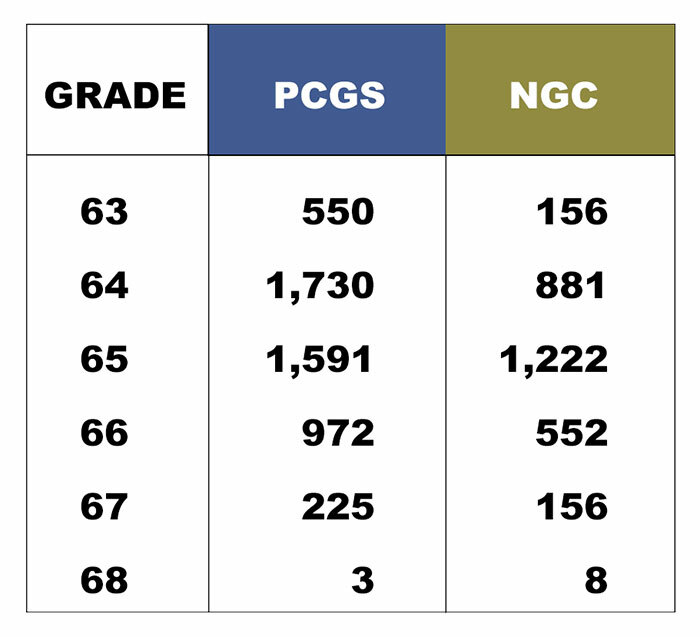 PCGS and NGC Populations as of 1/18/2019. Taking a look at the certified populations at PCGS and NGC, we see that 8,046 grading events have been recorded for Albany half dollars. 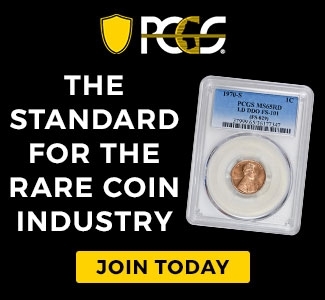 Although there is likely some redundancy to the numbers given the potential for crossovers from one company to the other and the likelihood that premium quality coins in grades 65 and above have been submitted multiple times for upgrades, this figure represents 45.7% of the Albany half dollar’s 17,671 total distribution. Grade distribution is heavily skewed between MS64 and MS66. Recent auction records indicate that the difference in value between examples in MS63 to MS65 is minimal. On eBay and other online auction venues, it is easy to find examples in each of these grades that sell for as little as $180 and for as much as $220, so long as we are looking in that 63 to 65 band. In MS66, we see the beginning of some price separation, but it is minimal. Three recent listings at Heritage Auctions yielded results between $220 and $280. On eBay, a recently completed listing (at the time of original publication) realized $255. Populations at NGC and PCGS dramatically decline as the state of preservation reaches MS67 levels. It’s highly likely that as struck, a majority of the coins in this issue would have graded between MS66 and MS68, but very few coins have maintained their original state of preservation in the 80+ years since their release. 2018 auction records for MS67 Albany half dollars reveal a typical price range of $480 to $550. With CAC approval, prices realized for 67s display a wide variance. In 2018, examples sold at public auctions for as little as $660 and for as much as $2,160. Eye appeal, undoubtedly, played a major factor in these price results. One assumes that professional flippers considered the upside potential that a high-end CAC MS67 might upgrade to MS68. In 2018, an NGC MS68 realized $7,200. The last PCGS MS68 to sell at public auction sold for nearly $20,000 in 2011. To date, only three examples have earned the PCGS top-population grade of MS68. A naturalistic depcition of a North American beaver (Castor canadensis) chewing on a branch of maple, replete with leaves, occupies the majority of the design. The legend UNITED*STATES*OF*AMERICA arcs clockwise along the top half of the coin along the rim. Clockwise beneath the words “United States” is the Latin phrase E PLURIBUS UNUM (“Out of Many, One”); clockwise beneath the words “Of America” is the future national motto IN GOD WE TRUST. Both inscriptions are in much smaller text than the others. Counterclockwise at the very bottom of the side is the denomination, HALF*DOLLAR. Renderings of maple tree seeds divide the top and bottom inscriptions, one on each side. The beaver refers to Albany’s historic role in the colonial fur trade, while the maple is the state tree of New York. The reverse of the 1936 Albany half dollar features a modern rendition of the charter ceremony establishing the City of Albany in 1686. Governor Dongan is represented on the left, shaking hands with Mayor Pieter Schuyler, who is depcited holding the city charter in his left hand. Next to and behind the mayor, in jugate profile, is Robert Livingston, a wealthy area businessman and Schuyler’s brother-in-law who, together with the mayor, convinced Dongan to issue the charter. A pine tree is located behind the men, and an eagle with wings spread is seen mid-flight above them. The date 1936 is found in the ground/exergue beneath the men’s feet. The inscription SETTLED*1614*CHARTERED*1686 runs clockwise along the top of the side along the rim. At the very bottom, the phrase ALBANY*N*Y* runs counterclockwise, with mirrored pairs of pine cones serving as dividers on either side. Designed by the artist Gertrude K. Lathrop (1896-1986), a native of Albany and one-time student of Gutzon Borglum, the initials “GKL” are located next to the feet of Governor Dongan.